Virginia is made up of five geologic regions: the Coastal Plain (tidewater), the Piedmont, the Blue Ridge Mountains, the Valley and Ridge, and the Appalachian Plateau. As you examine the map below, consider how the differences in climate, landscapes, and resources in these regions have shaped how Virginians have interacted with their environment. Each region has unique geologic and geographic formations. The Coastal Plain lies east of the Fall Line and is characterized by flat, comparatively soft rock foundations. The Piedmont lies between the Blue Ridge Mountains and the Fall Line and is characterized by rolling hills. The Blue Ridge Mountains are old, rounded mountains that lie between the Valley and Ridge and the Piedmont. The Valley and Ridge, with the Blue Ridge, is a part of the Appalachian mountain range and is the source of many of Virginia’s major rivers. Located west of the Valley and Ridge is a part of the Appalachian Plateau, an area of elevated land that is flat on top and lies mostly in neighboring states. Virginians interact with their environment in different ways in each of these regions, as local climates, landscapes, and resources impose various limits and opportunities on activity. The Piedmont, for example, is a fertile area where much of Virginia’s farming takes place, while the Blue Ridge Mountains have become a popular recreational destination, especially since the New Deal Civilian Conservation Corps’ efforts in the 1930s built the Blueridge Parkway and Skyline Drive. Source: C.M. 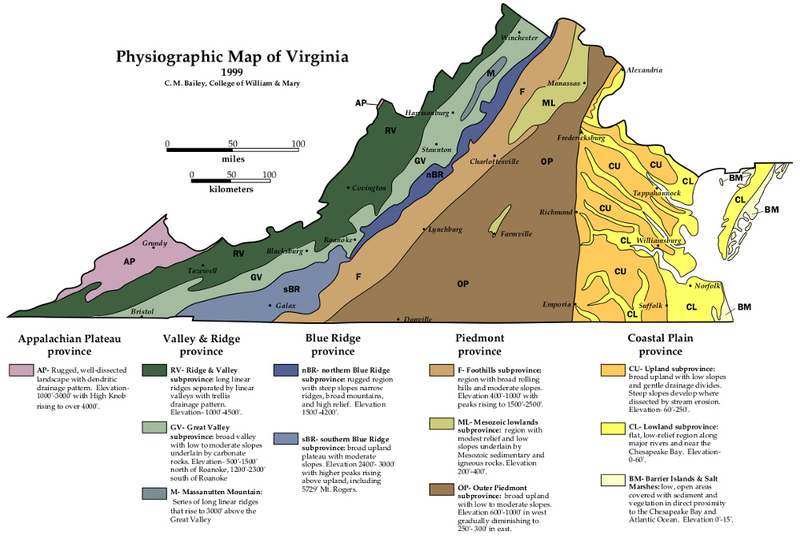 Bailey and Chad Roberts, “Physiographic Map of Virginia,” (Williamsburg, VA: College of William & Mary Department of Geology, 1999), accessed September 17, 2018. Explore the following resources to learn more about historical thinking. Click on an image thumbnail to load it in the main area. After exploring all of the resources, continue to the next page.